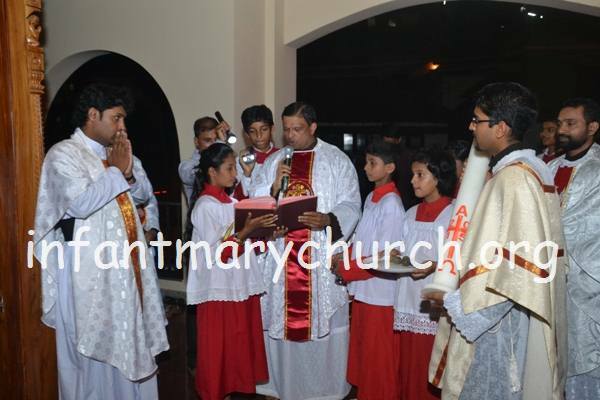 The Easter celebration was held at Infant Mary Church, Bajjodi on April 4, 2015. The ceremony started at 7.30 pm with the blessing on the fire to consecrate it and the lighting of the Pascal Candle. The blessing and the renewal of the Baptism vows was held thereafter. It was followed by the Eucharistic celebration along with the Homily given by Fr. Stephen Pereira. Fr. Deepak was the main celebrant of the ceremony concelebrated by Rev. Melwyn D'Cunha along with two others.